Backpack: How do I SMS events to my calendar? How do I SMS events to my calendar? This screen display your code (unique for everyone – don’t use the one you see in this example screenshot) and a phone number. Text this code to the phone number using your mobile phone. 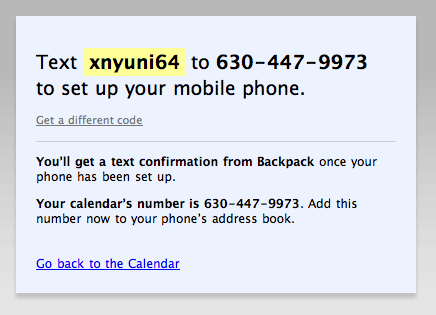 This will registered your phone number with your Backpack calendar. You’ll then get a confirmation back on your phone saying everything is set up, or that there was a problem. 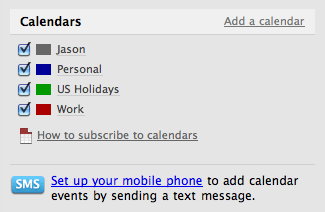 You can add events to your calendar via SMS using the same formatting as you use on the web. For example, SMSing “April 23 3pm Dentist” will add a “Dentist” event to your calendar at 3pm on April 23. Or “9am Client meeting” will add an “Client meeting” event to your calendar today at 9am. Or “1pm tomorrow Fedex the contract” will add a “Fedex the contract” event at 1pm tomorrow. Here’s something else really useful: You can ask your calendar what your schedule looks like via SMS. If you just SMS “Tomorrow” Backpack will SMS tomorrow’s schedule back to you. Or SMS “April 7” and you’ll get back your schedule for April 7. It’s that easy. Here’s a screenshot from the SMS app on the iPhone 1. showing the setup confirmation, 2. checking the schedule for tomorrow and April 7, and 3. adding a dentist appointment at 3pm on April 23rd. How do I enter dates and times in the Calendar?